When Gordon Dugdale is murdered, his father, the wealthy owner of the Broken Spur ranch in Arizona, threatens to take the law into his own hands. Now it is up to Jeremiah Meade of the Governor’s office to find the real killer before there is a lynching. Someone is out to get the Dugdale family – but who and why? And can Meade discover who is responsible before the plot for revenge succeeds and all the Dugdales are dead? Steven Gray has written over twenty BHW with the first appearing in 1991, and then one or two books per year until 2007, so this is the first for sometime, and a first for me, even though I do have a couple of the older books in my collection. 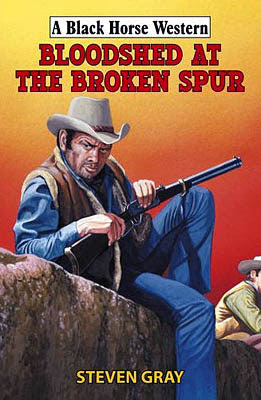 Bloodshed at the Broken Spur is also one of the longest BHW I’ve read. It has the same number of pages as usual but the print is much smaller than normal and there are many more lines per page. This book could easily fall into the category of a murder/mystery. It’s extremely well written with the author being an expert in keeping the reader guessing as to whom the killer is and why the Dugdales are being targeted. The first two thirds of the book introduce the main characters and throws suspicion on many of them. The story is told from a variety of viewpoints, even having the occasional short paragraph relating the killers’ thoughts – these being carefully written so as not to reveal this persons identity. The story is dialogue driven and well paced becoming a race against time which all leads to an exciting showdown and a neat and somewhat surprising ending. I know nothing about this author, other than having read somewhere that Steven Gray is a pseudonym for a female writer, but what I do know is that on the strength of this book I will be hunting out those other books I have very soon. Texas, 1860 – where the Trailsman is about to learn that no matter how bad things seem, they can still go south. The notorious Sevier family has always hovered like mean buzzards over the city of San Antonio, never working a day if they can steal for a minute. But now they’re being run by baby-faced stone-cold killer Ike Sevier. And the only man with the guts, the guns, and the gumption to stop him is the Trailsman…. 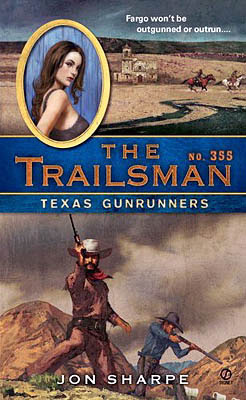 This book is filled with great characters, all of who will cause problems for The Trailsman. Favourites for me include Adelita and of course the very memorable villain, Ike Sevier, who always seems to be one step ahead of his pursuers, a lot of this tale being a chase story. Like most Trailsman books this is a fast paced read filled with action. All is told extremely well and builds to an exciting climax. The author behind the pseudonym of Jon Sharpe this time is James Reasoner and having read this just before reading James’ last Longarm novel it’s interesting to see that they both have San Antonio as the starting place for their stories, and both mention the Bat Cave. If you’re a fan of James Reasoner’s writing, and/or the Trailsman series, then this book is one you shouldn’t miss. And let’s hope, like the Longarm novel, this isn’t his last entry into the series. The Scattergun Gang were the worst bunch of killers that Texas had ever seen and they had Josh McCall’s wife as a hostage. There were no definite clues, only a relentless trail through Indian Territory, a place infested with outlaws on the run – all with an eye for a fast buck and all willing to put a bullet in your back if that was what in took. But McCall was ready to take them all on, even if he had to use his bare hands…. Nothing would stop him getting Rosa back. Nothing. Hank J. Kirby starts the book with a bank raid that can only be described as explosive. The violence of this mellowed a little by the humorous touches that Kirby includes in this opening sequence – some of which had me laughing out loud. From then on the book takes a slightly darker tone, as McCall hits the trail in search of his wife. His actions at times almost as savage as the gang he is chasing down. The action comes thick and fast as McCall encounters the army, another band of outlaws, a man who isn’t whom he seems, another who isn’t all he’s said to be, other men who see his hunt as a way to get some easy money…. All this leads to a dramatic final shootout where the identity of an assassin known only as The Spider is revealed. This story provides the reader with a very fast moving tale, filled with action, touches of mystery, and a few twists to the plot. All of these combine to make for a difficult to put down read. Then again I wouldn’t expect anything less from this author, as he’s been a successful western writer for a long time, with hundreds of books to his credit. 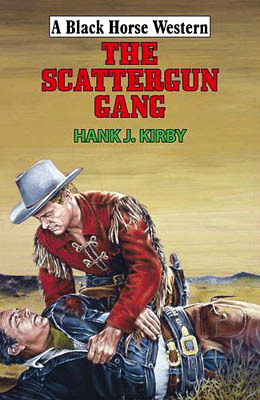 Hank J. Kirby being one of Keith Hetherington’s pseudonyms, and once more I’m left looking forward to his next book. John Tanner is returning home after serving two years in prison for shooting a man – but he pleaded guilty only to protect the young and pretty Becky Canasta, whose finger actually pulled the trigger. Now John arrives home to find that her father has had his safe looted and all his savings taken. Moreover, the robbers have taken Becky! Desperate to find her, John begins his quest in pursuit of the outlaws. News is out about the lost treasure and dozens of men are on the trail, battling with John to be the first to the riches. But for John there is something much greater at stake – the treasure is his only clue to Becky’s whereabouts and her part in the robbery. Treachery and violence do not deter John – he will follow the trail to Hell if that is what it takes…. This really is an action packed read. Nearly every chapter has some kind of fighting within it, be it with fists or guns. The prose is straight-forward and flows smoothly as the author presents what a first seems to be a fairly traditional plotline, yet still manages to keep an air of suspicion over many of his well-drawn characters. John Tanner makes for an interesting hero, a man who is perhaps a little too trusting. A man who once his mind is set on something will do anything to see he achieves his aim. A man who slowly begins to recognize that everything might not be as black and white as it first seems. As the story nears its end Logan Winters springs a surprising revelation about a couple of his characters that I didn’t see coming. A twist that immediately explains much of what has been going on, yet still leaves some confusion for Tanner to try and work out. After finishing this story I’ve been left looking forwards to Logan Winters’ next book, but know I don’t have to wait that long to read another tale by this author for Winters is a pseudonym of Paul Lederer and he has a second BHW out this month under his other pseudonym of Owen G. Irons: a book called The Predators. If a hard life makes harder men, then Eli Gault is cast-iron in boots. Raised by a merciless, drunken fire-and-brimstone preacher, young Eli avenged himself upon his pious pa. Then, after he took all the kind charity he could handle from the local ladies, Eli’s killer instincts forced him to go on the run, with nothing but his guts and guns to keep him alive. This is a book told in the first person. It’s a story of a young man who, through unfortunate circumstances finds himself forced to kill time and again, something he discovers he’s very good at. J. Lee Butts writes extremely well. His style makes this a difficult book to put down. 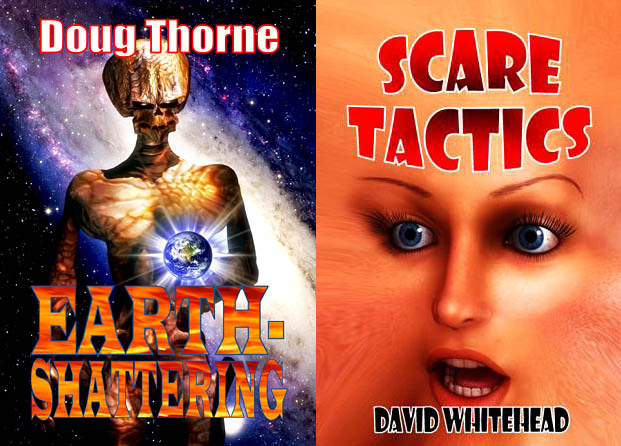 He fills the story with colourful and engaging characters. The book has plenty of tough and brutal action as we follow Gault’s attempts to settle down, even taking on a job as a deputy at one point, but each time he finds himself having to kill again and once more having to go on the run. Butts also includes plenty of humorous observations, often commenting on human nature. Even though Eli Gault is a likeable hero you can’t help but think that the book can’t end well, especially as the opening scenes see Gault sitting in jail awaiting the hangman. The main part of the story being told as a long flashback. The end of the book is powerful and memorable. 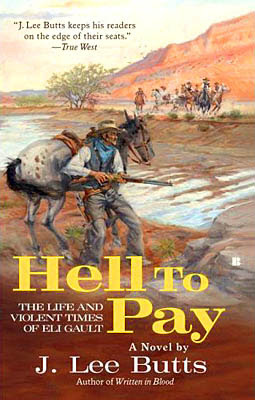 Hell To Pay is the first J. Lee Butts book I’ve read, but on the strength of this it most definitely wont be the last. The Wild Land: Savage and dangerous, the unmapped territory west of the Mississippi presented constant challenges to anyone who dared venture into it. Yet as the cities of the new country grew into overcrowded metropolises, a young man had to head to the unexplored region if he hoped to fulfil the great American Dream of liberty. The Courageous Spirit: Undaunted by the countless threats that imperilled them, Nathaniel King and other brave mountain men struggled to build a life unfettered by the corruption of society. It was a fight to the death, and only the strong could hope to survive. The Never-Ending Battle: When a group of English travellers journeyed into the Rockies, they had no defense against the fierce Indians, deadly beasts, and hostile elements. If Nate and his friend Shakespeare McNair couldn’t save them, the young adventurers would suffer unimaginable pain before facing certain death. 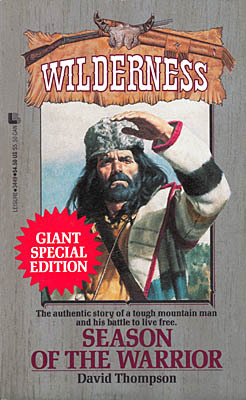 This, the second Wilderness Giant Edition, fits chronologically after book number fourteen in the regular series, and proves to be a book filled with danger, be it from Indians or nature. One of the most memorable scenes being when the travellers are caught in the middle of a buffalo stampede. This is a book packed with action and incident that explores the way different types of people view each other, such as the so called civilized and those who live in the wild, and the differences in the way of life of those of different skin colour. The book is filled with colourful and memorable characters, strong and weak in both sexes. One of my favourites has to be the artist, Eric Nash, who undergoes many changes throughout the course of the story. It’s also his eagerness to learn and to run before he can walk that nearly sees the death of many of the group on numerous occasions. As well as lots of exciting confrontations the book also contains some terrific dialogue, often witty, often sarcastic, usually coming from Shakespeare McNair as he manages to baffles just about everyone at some point with his quotes from the Bard. The book ends with the Kings and Shakespeare many miles from their homes and the author (David Robbins) adds a historical note that explains what happens to other characters. Note: Those who are new to this series might like to know that the third Giant Edition: Prairie Blood, which date wise was published after book #19, was originally intended to be published directly after Season of the Warrior, and covers the Kings and Shakespeare’s journey home. Due to something that happens in Prairie Blood, that proves to be a major event in the King’s life, I’d suggest you read it before you read book #15 in the regular series. Like most of the BHW I’ve read this book is a quick, fast-paced read. The opening section paints Hogan and his hands as totally evil men fuelled by greed. The crushing of Shannon’s hand being particularly well told – even if the problems this gives him later are almost glossed over, other than him having to learn to use his pistol left-handed. Shannon’s plan of revenge is well told, although I’d have liked to see a little more variety in how he kills Hogan’s men. The legend of the phantom gunman that arises from Shannon killing Hogan’s men adds an extra, and welcome, element to the story. But it’s not just the desire for justice that fills the plot as Shannon also finds he’s the centre of a love triangle, which adds further complications to his quest for vengeance. The book doesn’t have any twists, just being a straightforward plot of good verses bad, making for a pleasant couple of hours of pure escapism. Mexico, 1868. Two men. One white, one colored. Proficient in shooting with the long arm, the greatest long-range weapon of the age. The .50 caliber Sharps rifle. The ex-sharpshooters Nick Guardeen and Thaddeus Johnston receive an invitation from the Arizona State Governor. He offers them something they’ve never had before: land. So, for the promise of their very own homestead, they accept a highly dangerous mission across the border into Mexico. Hounded by a merciless gang of assassins, they press on into the desert redoubt of the self-styled and ruthless General Wyatt whose crazy ambition is nothing less than reinstating the Confederacy. Their only assistance comes from the beautiful and mysterious Christine Lenoir. She risks all as a spy in the heart of the renegade fortress, driven by her hatred for the General. Nick and Thaddeus need all their skills and fighting technique to survive against Apaches, murderers and a reinstated army of rebel forces. To my knowledge this is the first published western by Tony Masero. His name will be instantly recognizable to many western fiction fans though, particularly those in the UK. Why? Because he is best known as an artist, the man who painted the covers for the highly regarded George G. Gilman series: Edge, Adam Steele, and The Undertaker. 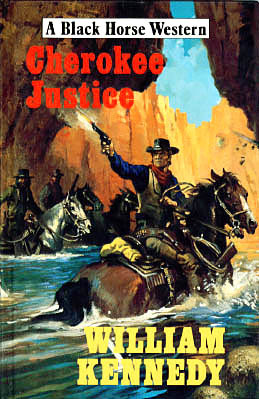 His artwork also appears on many other books and has recently begun fronting Black Horse Westerns. So what is Tony like as an author? Very good is the quick answer. The Riflemen is a fast moving tale that’s packed with action as the two ex-sharpshooters take on vast odds. Their characters have been carefully thought out and you’ll soon be urging them on to complete their mission. They aren’t the only memorable characters though; Black Band Doolin, Cave Wyatt, Billy Ray Laforge, and Christine Lenoir, will stick in the mind too, all for very different reasons, the latter of these adding intrigue to the story, as to why she wants revenge against Wyatt. Tony Masero sets scenes well with brief but detailed enough descriptions that paint vivid imagery of the locations his story is played out in. Dialogue is handled confidently, and often has touches of humour within it. The story builds well to its action-packed final chapters – Billy Ray’s downfall providing a great laugh. 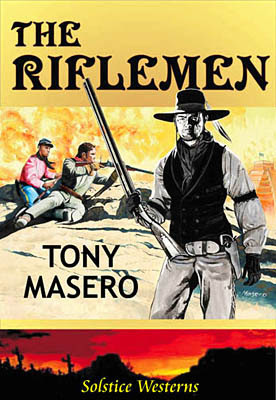 After finishing the Riflemen I’ve found myself hoping it isn’t too long before another book appears from Tony Masero. If you are intending to read this book then please skip the second paragraph below, which is the blurb from the book, and in my opinion gives away too much of the plot. Tells you the secret of the Star of Father Cristobal, a secret the author doesn’t reveal until near the end of the story. When someone steals the Star of Father Cristobal from a mission in San Antonio, Deputy U.S. Marshal Custis Long is called on to recover the religious relic. But with no witnesses to the theft, it’s gonna take a miracle to get it back. Right from the opening chapter this book piles action upon action. 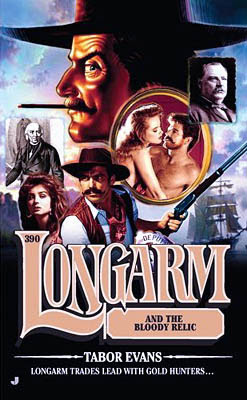 There’s gunfights, chases, and a little bed-room fun, and mystery, as Longarm attempts to find the Star of Father Cristobal and discover why it was taken, and by whom. If that’s not enough then there’s the kidnapping to add further intrigue. And then there’s Longarm’s desire for revenge – his need to kill a couple of bad-guys for murdering an innocent girl. So, as I said, this is an action packed book, that starts fast and keeps upping the pace until the secret of the Star is solved and a final showdown takes place, resulting in a just death for the main bad-guy. Great to see Jessica Starbuck get a few mentions too. As does her final adventure in the Lone Star series – I can’t say more than that without giving away part of this story. When I tell you the author writing behind the pseudonym of Tabor Evans this time is James Reasoner, I’m sure many western readers will realise that they are going to get a quality read from this book. In fact I’d say this is one of James’ best entries in the series, and he’s written a fair few of them since his first appeared way back in October 1993. Sadly it seems this will be his last, and if that does turn out to be true then it’s definitely a great book to finish with. Let’s just hope James returns to writing Longarm books further down the trail. 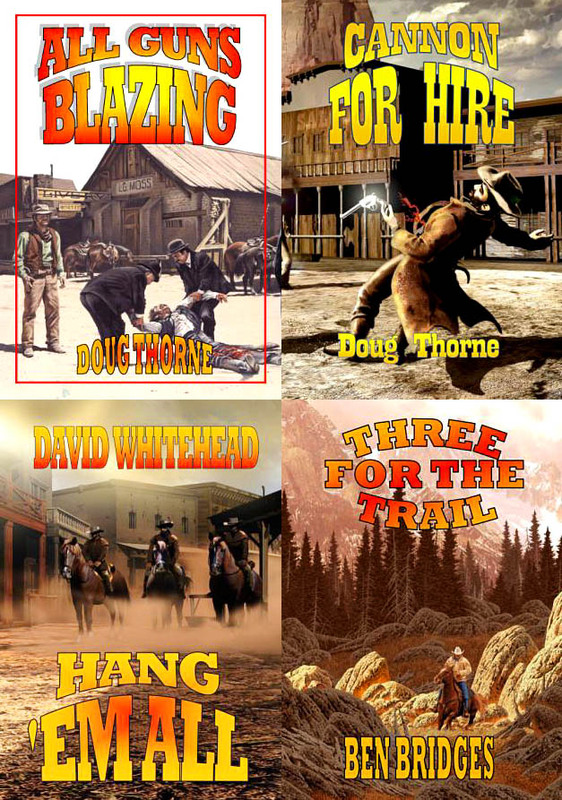 The Doug Thorne books are written with one of Germany's top western authors, Alfred Wallon. Hang 'Em All is the first in the Judge and Jury series. The Silver Trail is the first in the Carter O'Brien series. The Wilde Boys is the first in the Wilde Boys series. Apacheria is the first in the Sam Lockwood series. 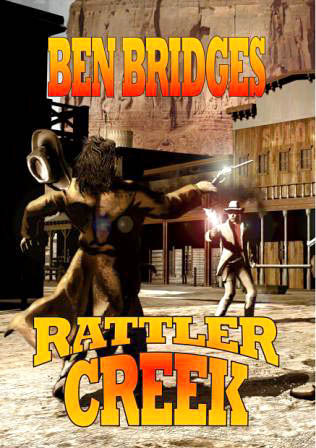 Rattler Creek is the first in the Jim Allison series. 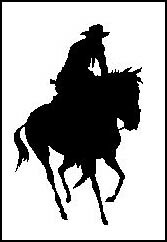 It is hoped that the following two titles will become available at this time too: Gunsmoke Legend, the first Ash Colter book, and Heller, the first in the Heller series. The latest issue of Black Horse Extra is out and, as usual, contains a great mix of western reading. New Black Horse author Lee Clinton looks at the book True Grit in depth and discusses just why it works so well. 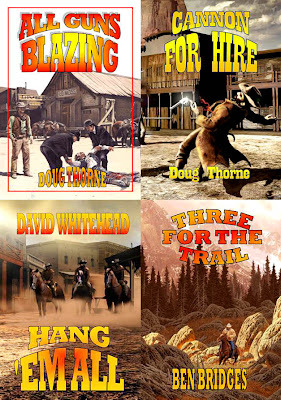 Jack Martin offers thoughts on writing hardboiled westerns. And there's plenty of other articles to enjoy too. 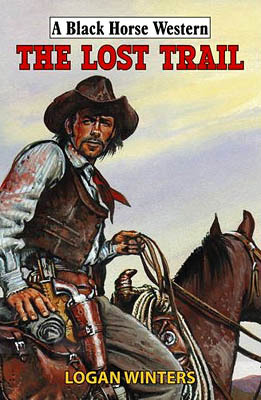 Troy D. Smith has written a great article at Western Fictioneers that looks at Western Comics. Jory Sherman has appeared in two interviews recently and these can be found here and here. An interview with Robert Randisi can be found here. An interview with Peter Brandvold can be found here. And if you enjoy watching some of the more obscure and unknown western films, David Robbins, has been posting about some here. These include Johnny Depp in Dead Man, Brad Hunt in The Journeyman, and Sam Shepard in Purgatory.